Card storage used to not be an issue. Hobby shops have long offered big white boxes with varying columns to store cards. You can get the shoebox sized one with two columns, or you can go big and get the 5000 count, five column wide box. With the emergence of one-touch holders becoming more popular, what are good methods to hold them? I have a couple suggestions, but I'd love to hear yours too! You can call me a neat freak. I want all my stuff to be easily organized, and I want the tools to be able to do that. 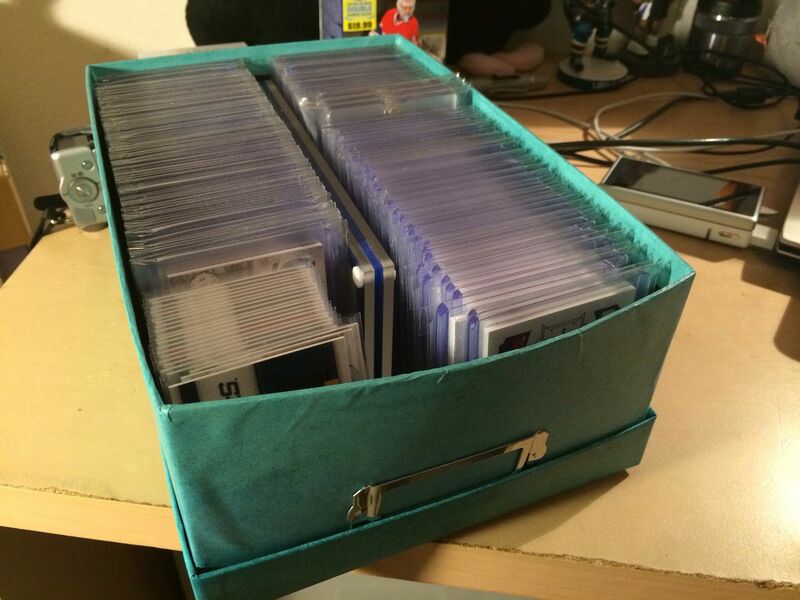 When I collected cards as a kid, I'd set aside some money to buy white card shoeboxes or the different card storage boxes that could hold more. My favorite was the medium sized 3200 count box. That one held a good amount of cards, but wasn't as difficult to handle as a 5000 count one. 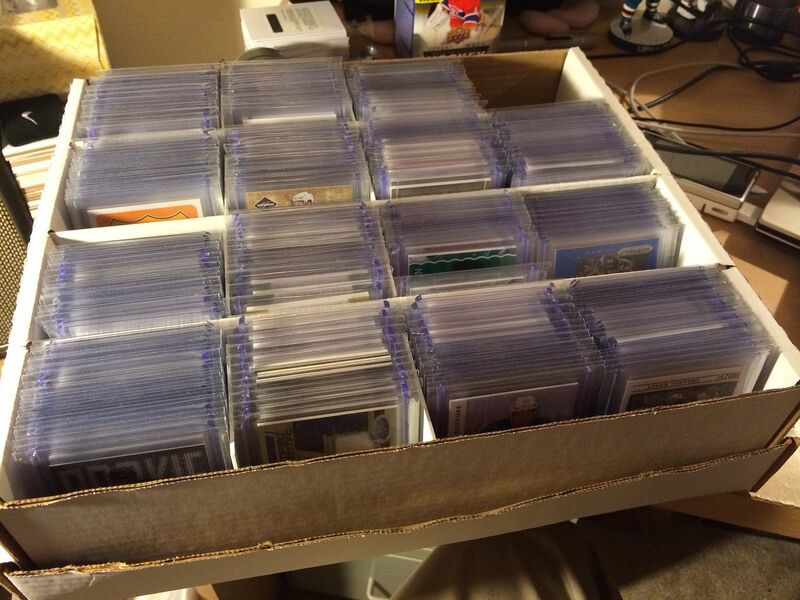 These large boxes allow collectors to store a lot of base cards. And they are roomy enough that the base cards can be sleeved as well. I loved it! The problem comes when you want to store cards in top-loaders or one-touches. Because of the extra width, the cards in these storage devices don't work well with the afore mentioned box products. And for me, I actually add even more width to the top-loader or one-touch by putting each of those in a team bag. 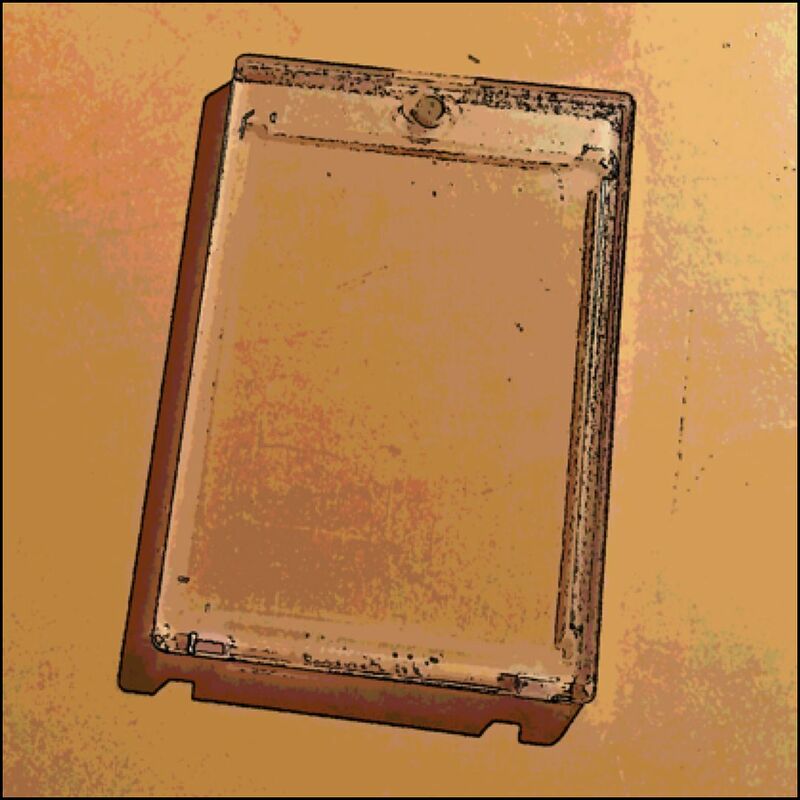 It would be great if a company came out with a box that could hold that width of card and card holder. But that don't (yet). So here's what I do. Method One - Photo box. At craft stores like Michael's or even Wal-Mart and Target, you can find these photo boxes. They come in a variety of colors and usually have a top to them. I have found that you two columns of cards either in top-loaders or one-touches sit perfectly in them. The cool thing is that you can usually find them for pretty cheap. The variety that they come in allow you to organize according to color or go with a theme such as your favorite team. Notice that this one is teal! Teal for the San Jose Sharks, of course! When you put the lid on them, they stack very nicely. For those who are really organized, you can put a label on the front as there is a place for that. Method Two - New Way of Using 3200 ct. box. The other way I store cards is by using the 3200 ct. box in a different way. Rather than putting the cards in they way they want you to, I turn the box on so that the side faces me and put the cards in this way. By doing this, you can fit a few columns of cards side-by-side. It's not perfect, but it works. To avoid cards sliding into different columns, I use decoys from packs and place them between each column of cards. Now these 3200 ct. boxes can be repurposed for more than they were initially intended for! I am always looking for more ways to store my cards. How do you guys do it? Let me know of any tips you have in the comments section. I'd especially love to hear the ones you have that allow you to organize top-loaders and one-touches. Suggest away! Salland Storage responds to the need to hire cheap safe temporary storage, furniture storage, storage, and business for the cities of Deventer, Zutphen and Apeldoorn for both individuals and businesses. In the case of a relocation or temporary stay in another home address can be saved as storage furniture, furniture, household goods or other items at a low price from us.